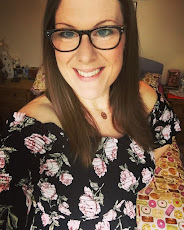 Today I'm excited to share with you some fabulous products from new-to-me brand, Edge of Belgravia. Edge of Belgravia produce unique designer chef knives, and very kindly sent me their professional four piece knife set and diamond knife block to put through their paces in my kitchen. Any serious home-cook or chef will tell you how vitally important a good quality, super-sharp set of kitchen knives are...what is it they say...'a bad workman always blames his tools' ... but seriously, good knives = better, faster and more professional dishes coming out of your kitchen. 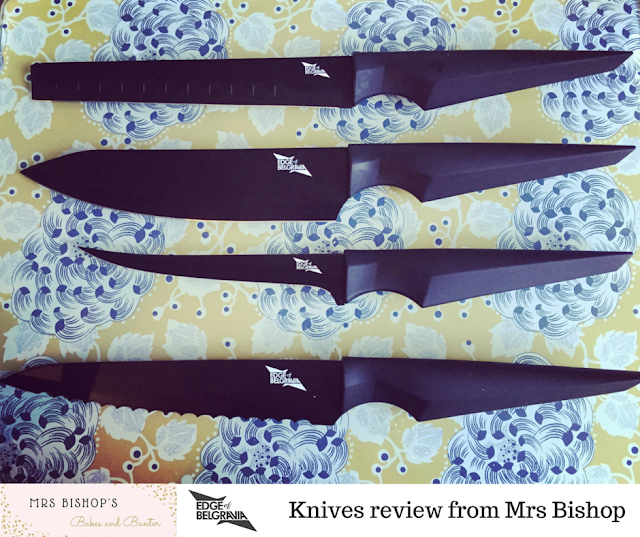 In my experience is it absolutely worth investing a decent amount of money into your kitchen knives - you get what you pay for and all that. One of the main things that struck me about this knife block & set was not only the quality of the product but how beautiful they are to look at too - a real feature of the kitchen. 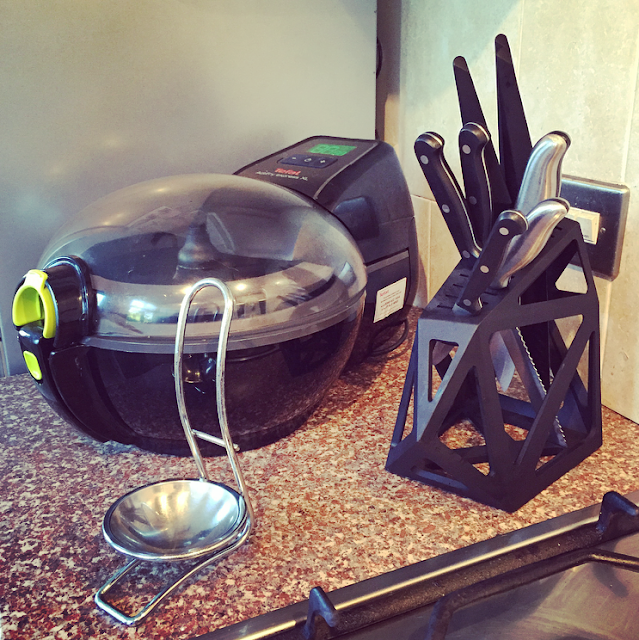 The black diamond knife block in particular is so striking and would look incredible in a modern monochrome kitchen. Our unique, angular float knife block designed by Christian Bird is a piece of art for the kitchen. Clever use of weighting secures the knives in their blocks, just as slight angling allows for easy extraction. Designed for maximum flexibility it is suitable for most knives. 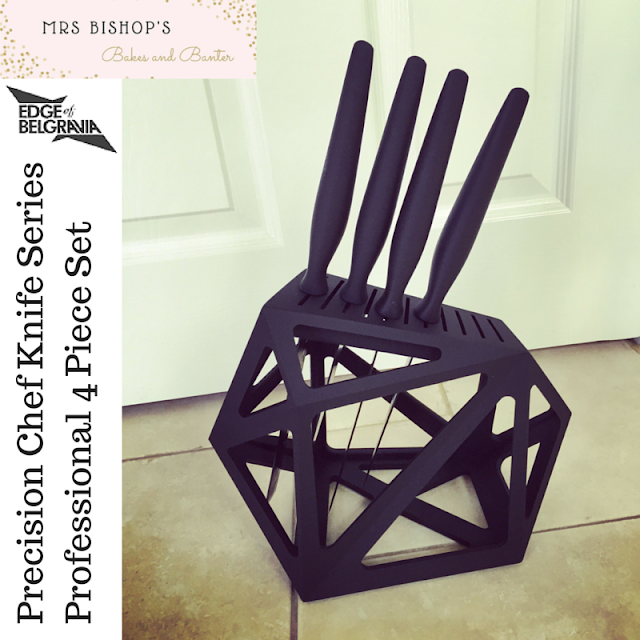 The professional four piece set complements the existing knives in the Precision Chef Knife Series. 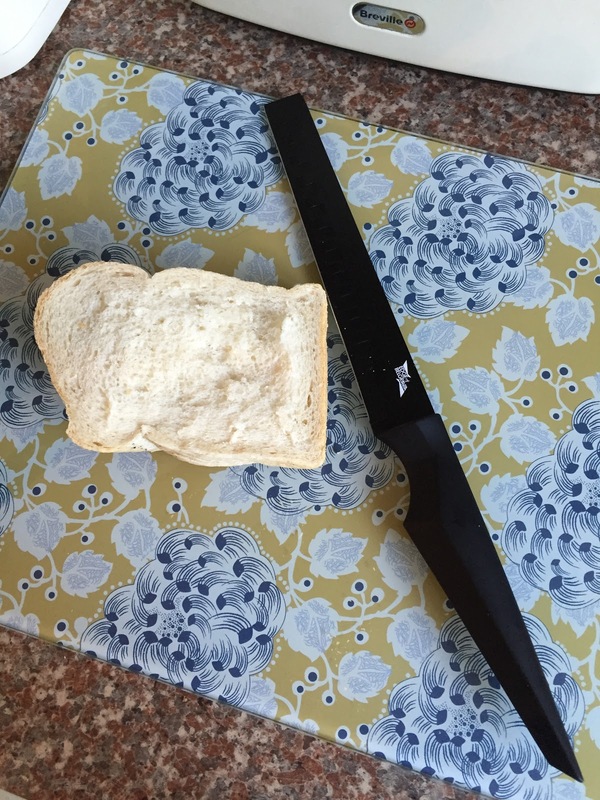 Its extra-large chef and bread knife means it is ideal for all those who think bigger is better. The set includes a new knife for filleting and boning fish, and we introduce a slicing knife with unique recesses so that you can slice salmon or cured meat in the thinnest of slices. The professional set will have you dicing, slicing, chopping, filleting and mincing with impressive ease. If you are not already a Chef, you will be with this set. I've now been using these knives for around a month in the kitchen and I really love them! 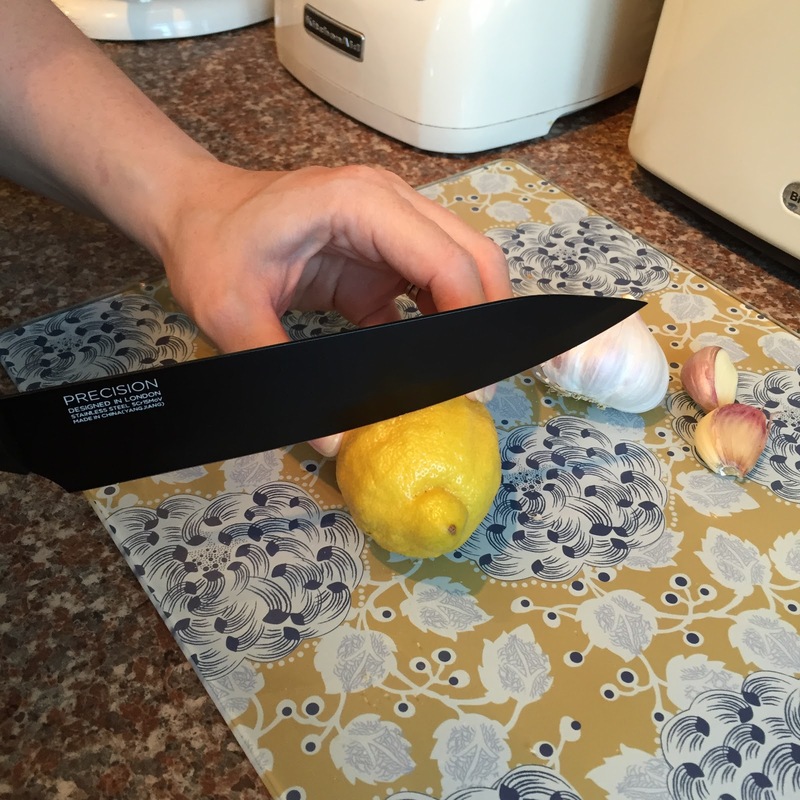 They feel so nice to hold, the handles are comfortable and easy to grip, and the blades are so super sharp - they slice through everything like butter, which makes food prep a dream! Each of the knives slot perfectly into the diamond knife block, and one of the best features is that the knife block has room for up to 11 knives, so I can slot all of my other kitchen knives in there too - keeping everything together and organised (and you know I do love things organised!). 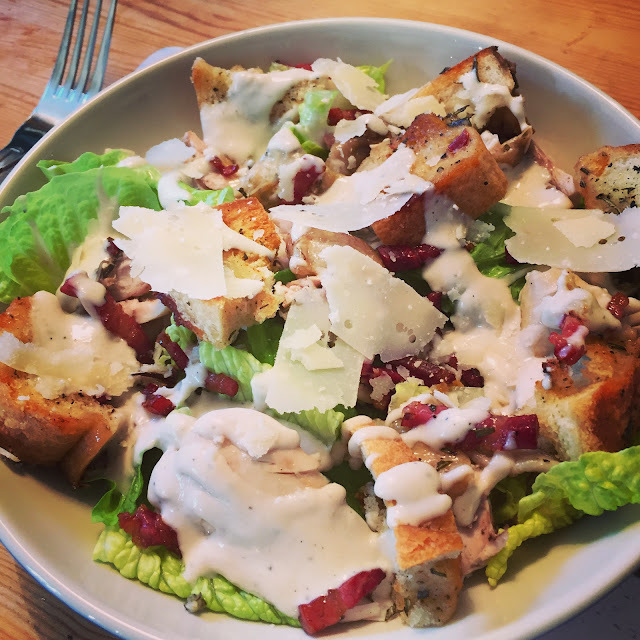 This week, feeling a bit more human and with more energy to get back into the kitchen properly I decided to make a Caesar properly from scratch, and boy was it awesome! 1. Pre-heat the oven to 180 degrees. In a deep roasting tray place the bread cubes, drizzle over a generous amount of olive oil, sprinkle over half the chopped rosemary and season with salt and pepper. The sharpest bread knife ever! 2. Place the four chicken legs atop the bread trivet in the roasting tray, drizzle the chicken with olive oil and again, sprinkle over the remaining rosemary and season with salt and pepper. Cook for 45 minutes until chicken is cooked. Putting the knives through their paces...with lots of chopping and dicing. Yummy ingredients for the ultimate Caesar dressing! 3. While the chicken/bread bakes make the dressing. 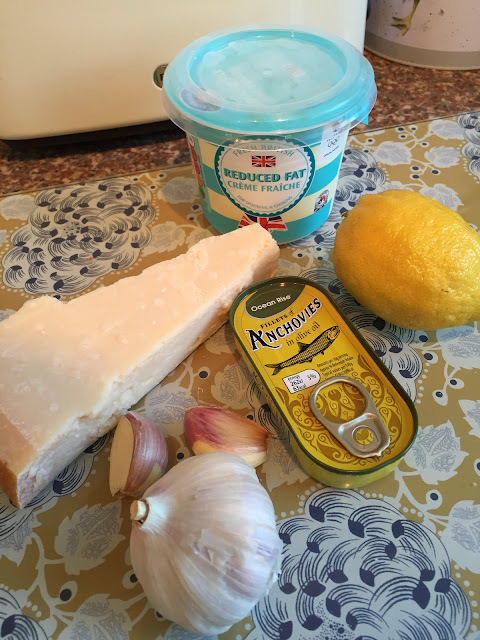 Lightly whisk creme fraiche, lemon juice and olive oil together until combined, add grated parmesan, anchovies and chopped garlic, then blitz with a hand blender until smooth. Season to taste with salt and pepper. 4. 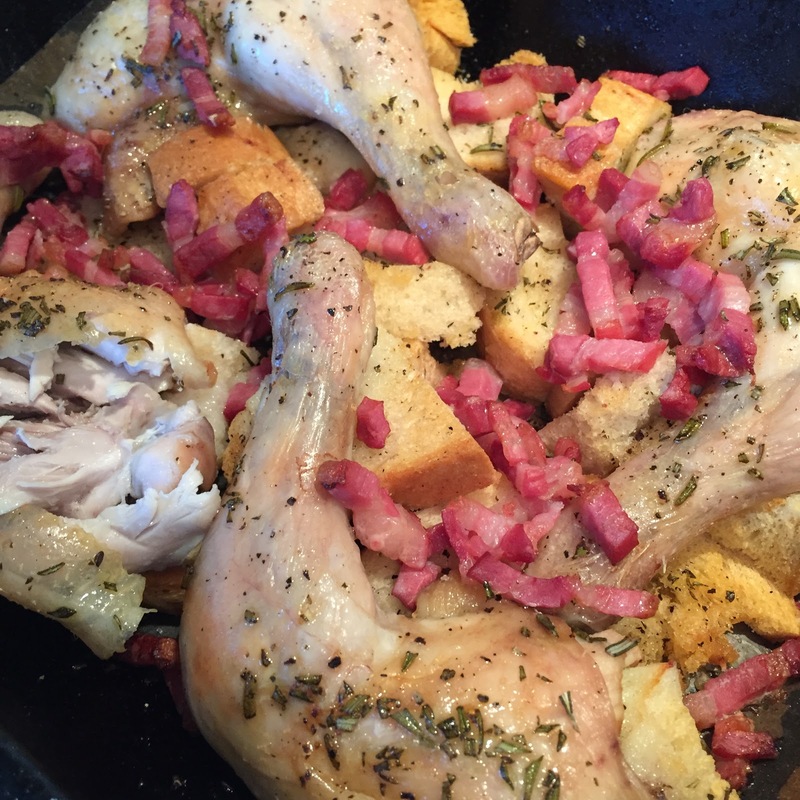 After 45 minutes take the chicken out of the oven and sprinkle over the pancetta cubes. Bake for 15 minutes until pancetta is crispy. 5. Remove chicken legs from the tray and set to one side to cool slightly. Pop the bread/bacon back into the oven to make sure any soggy bits crisp up (about ten minutes). 6. While bread is crisping up cut up your heads of lettuce wash/spin it until clean and dry. Take the chicken meat off the bone, and discard the bones. You want to try and get nice mouth sized chunks of chicken for the salad. 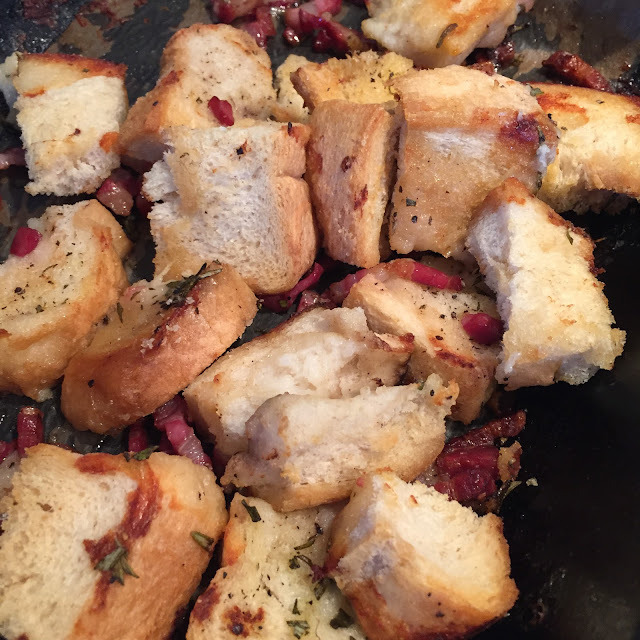 The BEST croutons in the world. 7. Assemble. Divide the chicken, bacon and croutons among 4 dishes of lettuce and then dollop over the amazing dressing and sprinkle over parmesan shavings to finish. Alternatively serve in one huge dish and let people help themselves. EPIC Chicken Caesar Salad, from scratch! Not only was the salad a dream to eat, but it was a total dream to make too - the knives made all the prep super easy and gave the dish a much more professional over all finish. 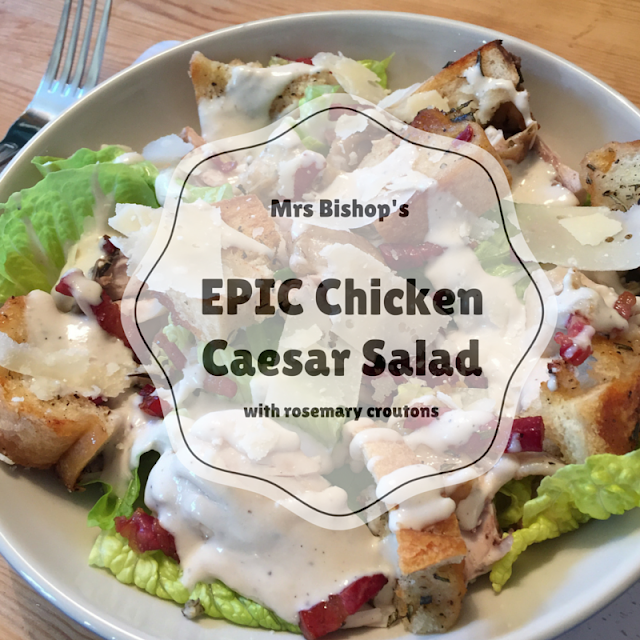 Granted, it takes a lot more time and effort to make a Caesar from scratch compared to opening a bag, ripping up some pre-cooked chicken and dolloping on sauce, but boy was it a superior version - Caesar salad on steroids if you will. On taste, texture and appearance it absolutely wins hands down - the ready made wins on speed, cost and ease. The pre mixed bags absolutely have their place, but every now and then it is nice to pull out all the stops and have something extra special, and this is one of those recipes. 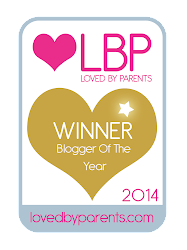 Do let me know if you give it a go, I'd love to know what you think! Disclaimer: I was sent the 4 piece knife set and diamond knife block in exchange for my honest review.